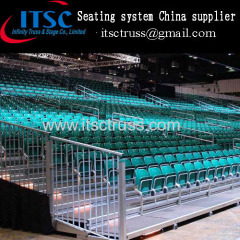 Stage risers is also named Arena Seating System, Arena stands, seating risers, seating system. It is usually constructed from common mobile staging system,It can be aluminum or steel or mixed. It is for both indoor and outdoor events, and it is waterproof and movable.Chairs are also offered. Group of Stage risers has been presented above, want more	Stage risers and Arena seating system, rising seating system, arena stands, Please Contact Us.